In the previous post I wrote about the work of Tristán and Michaud in Costa Rica and their papers from the early 1910s on infrared. They were somewhat prolific with their infrared research, including a paper on the appearance of soils, skin and insects over the next few years. I had been searching for a copy of the article they published in Scientific American on how insects, especially butterflies, look in infrared. Very kindly Michael Mielewczik from the Institut für Agrarwissenschaften (agricultural science) in Zurich sent me not only a scan of the SciAm pages but also a paper he co-wrote on a very similar subject. Tristan and Michaud had black and white infrared film to work with but Michael and his colleagues have made good use of a digital camera with no infrared blocking and bandwidth-limited to 675-800 nm (deep red/near infrared). The resulting colour palette, presumably due to the optical properties of the beyer filtration on the sensor, is mostly red/magenta. A photograph of a green tree python is particularly striking but the paper really concentrates on insects. 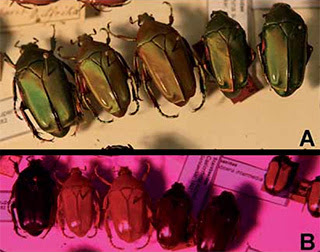 Here's an example image showing visible and infrared reflectance characteristics of a group of preserved rose chafer Caelorrhina superba beetles. The different infrared tones can be clearly seen (B). ... and you can access the paper as a PDF on the ETH Zurich web site.